It’s been a busy month in Austin! After wrapping up our annual Nonprofit Technology Conference (NTC), NTEN’s CEO, Amy Sample Ward, and I quickly recharged for SXSW Interactive, where we partnered another year with Beaconfire to host the Beacon Lounge for social changemakers, and with the NonProfit Times to cover stories on the nonprofit technology sector. 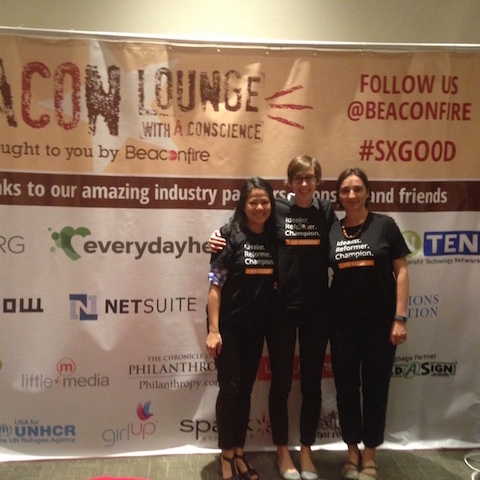 Pictured on the right is a snapshot from the Beacon Lounge, with NTEN’s Amy Sample Ward and NetSuite’s Peggy Duvette. It’s fascinating to see a city transform to the whims of this enormous festival, which draws in over 30,000 people from around the world. Coming right from the NTC, I couldn’t help but notice and appreciate all the hard work that went on behind the scenes by workers in the Austin Convention Center and beyond to bring this conference to life, as well as wonder how many gallons of coffee was consumed to keep it going. Throughout the conference, Amy and I wrote articles on a select group of sessions highlighting innovations at the intersection of nonprofit technology and social change. This coverage appeared in the NonProfit Times, check them out! How is it possible to establish meaningful relationships to create and mobilize for change in this noisy digital age? In a discussion led by Sara Thomas from the World Wildlife Fund (WWF), panelists from PETA, Change.org, and DoSomething.org shared key elements behind some of the most successful campaigns that their organizations have been a part of, and the personal and emotional connections behind the scenes that have resulted in real impact. There are inevitably many formal sessions at SXSW Interactive, virtual announcements or product launches, and hallway conversations about new platforms and mobile apps. Many are designed to bring people together to share stories and content, create digital watering holes, and make connections. Amidst that backdrop, one session hosted a critical conversation about the real issues of online harassment and opportunities for organizing for change. Dr. John Snow mapped the cases of cholera in London’s Soho neighborhood in 1854, thereby tracing the source of the outbreak, and inspiring reform in water and waste management in London and beyond. More than a century and a half later, data visualization’s surging popularity can be seen in the countless free and paid tools and services to create your own visuals, new academic programs, and high number of jobs in this particular field. In the U.S. alone, some labor analysts believe that people are needed to fill an estimated 1.5 million data interpretation–related jobs. For many people around the world, digital literacy is more than gaining access to online content but truly having access to independence through education and banking. At SXSW, Sophie Kelly, CEO of The Barbarian Group, facilitated a discussion about the benefits and challenges of digital currency with Roya Mahboob, co-founder of Digital Citizen Fund, and Joyce Kim, executive director of Stellar. While the mantra of social media encourages individuals to broadcast themselves to the world, the darker, more chilling side is its potential for exploitation of impressionable youth. During SXSW Interactive in Austin, Texas, four experts working in the field of countering violent extremism (CVE) discussed the current state of online recruitment in the session, On the Frontlines of the Social Media Jihad, and what can be done by online communities worldwide to deter this. 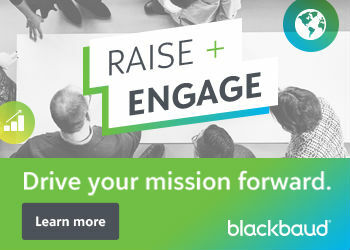 During SXSW Interactive, Veronica McGregor, news and social media manager at the NASA Jet Propulsion Laboratory, shared a bit of what’s earned them that ranking — successfully building engagement online that gets even stronger when they offer offline opportunities. After receiving more than 1,500 ideas to improve the design of an Ebola protective suit, USAID unveiled the winning design at a breakout session led by USAID representatives at SXSW Interactive in Austin, Texas. Perhaps the most remarkable aspect of this suit was the approach that USAID undertook to implement this idea: crowdsourcing. Joleen is a strong advocate of the nonprofit sector’s role in bringing about social change, and the power of technology to make this happen. At NTEN, Joleen is the editor of NTEN: Change, the quarterly journal for nonprofit leaders, and helps to support NTEN’s 50,000+ community members meet their mission through technology. Joleen is a published writer and researcher on the topic of nonprofit fundraising, communications, marketing, as well as international human rights and labor relations in Asia and Latin America. Prior to NTEN, she was the Communications Manager at Social Accountability International in New York for five years, where she focused on supporting programs to advance workers rights in factories around the world. Joleen earned her MS in Nonprofit Management from the New School, and BA in International Studies and Spanish/Anthropology at the College of New Jersey. She has led presentations on the topic of nonprofit marketing, communications, and sustainability worldwide. She is also a member/blogger of the Integrated Marketing Advisory Board (IMAB) and frequent webinar trainer for FundsForNGOs. Joleen is also the editor of two award-winning social justice documentaries that focus on responsible procurement with Fair Trade on college campuses, and military recruitment.